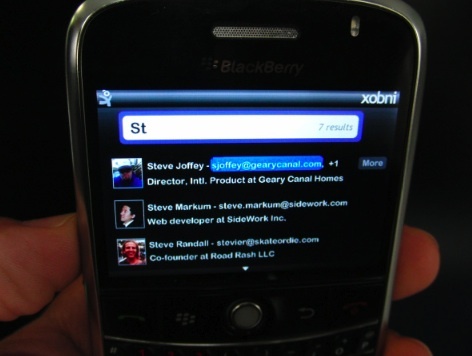 It’s been just one month since email startup Xobni got an investment from the Blackberry Partners Fund, which brought its total B round up to $10 million, and already it has a working prototype for an upcoming Blackberry app. Xobni executives were showing off the app at a Mobile Meetup in San Francisco last night, and the screenshot above found its way into my inbox (which is “xobni” spelled backwards, you know). Xobni, which is a plug-in for Outlook that incorporates data from various social networks, currently does not have a mobile client. But the company has hired a small team of engineers to work on mobile apps, with Blackberry being the first device to get one. Not only is there the connection with the Blackberry Partners Fund, but I’ve been told in the past that there is about 50 percent overlap between Xobni users and Blackberry owners. (There must be an Outlook-Blackberry mental axis out there). So it makes sense to go after the Blackberry first. But the startup cannot afford to ignore the iPhone. Can it?